You will have an enjoyable slot playing session when you play this betasoft released After Night Falls slot game. You will be able to play from just one single pay line right up to thirty pay lines when you play this After Night Falls slot game, which comes with a Crime type of theme. 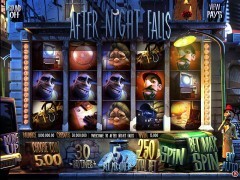 The After Night Falls slot game does not have a progressive jackpot, however the game jackpot pays 350 coins per coin per line you bet.BetSoft are a relative newcomer in the casino platform development sector, but have gained some real energy till now.BetSoft are currently best known for their wide range of high end, visually impressive slots games. After night falls is a gorgeous 3D graphics and animation game with the crime-themed slot. Three different sets of Free Spins are there that can be activated when you are playing this slot game, however you at first need four or five of the Detective symbols that are spinning in four or five of them and award you with fifteen and twenty-five Free Spins respectively. Each winning Free Spins will come with a multiplier from two to ten attached to them! A chance to win type of bonus is awarded for spinning in the Criminal symbols, when these symbols spin in on one base game spin then click on one of them to win a random amount of cash. To increase the value of a winning base game spin, you may wish to take the optional gamble game, this will keep you trying to guess what will happen when a coin is tossed, pick a head or tails and if that side of the coin is up facing after being tossed you double the value of your gambled amount. The value of the coin ranges from $0.02 to $0.50. You can bet even more than $75 per spin with 30 pay lines and five coins per line. Magnifying Glass on the reels in any position creates free spins activates the Moving Wild until it disappears from the screen. At least three Desks distribute the award of 10-25 free spins with all wins and are multiplied by 2-10. It is important to note that when betting maximum 30 paylines, Stacked Collapsing Wilds feature is only available. You can double up option by picking up heads or tails when your line wins are far from impressive. The highest maximum payout of 1,250 coins of this game is carried by Inspector Rousseau. There are a number of special features that provide the best chance to maximize your winnings. Just a few months after the launch of the original game, After the Night Falls was also released for mobile devices. This essentially means that the 3D slot plays just as well on the latest handheld devices, with none of the special features. This slot game features some very interesting characters, such as Inspector Rousseau, granny, cat burglar and cat, television, security camera, jewelry, and swag bag are also making the great appearance on the reels. Free Spins, 5 Rooms, Click Me bonus, Moving Wilds and an extra bonus round make things even more motivating, with double up option also included. The slots games of betsoft are a very exciting collection both visually and game play wise. It offers all the features that you would expect from doubling up to auto-play. Some of the best graphics that are seen on the market are also offered nowadays in this game. The software of this game BetSoft doesn’t appear to publicize the (RTP) Return to Player of their games, so in the future you will be able to get relevant information on the website. The betsoft has been also offered by the big names that makes it so popular and handy to the player for game sections and instant play options on their websites. Nowadays, the playing platform for instant gaming, the betsoft is solely being used s by many casinos.